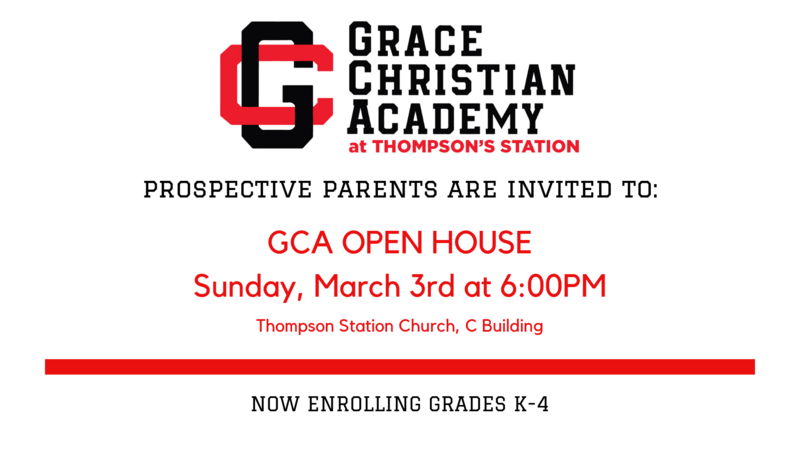 Grace Christian Academy at Thompson’s Station is now accepting applications for the 2019-2020 school year. Once you’ve submitted the application and admissions fee, we will contact you to schedule Shadow Days (1st-4th grade). The Kindergarten visit day will be on February 11th. Admissions testing is required of all students. Kindergarten testing is scheduled for February 8th and testing for 1st-4th grade is February 2nd and 24th. Upon completion of the above mentioned items and once we’ve received all required documents as outlined on the Admissions Checklist, Parent Interviews will be scheduled. For more information about our Thompson's Station campus, please email: TScampus@gcalions.com.